« Wondercon news coming soon!! Saturdays are always going to be the biggest day of any weekend comic convention. Most people are off work, they still have Sunday to recuperate, and Saturday morning cartoons can be TiVo-ed to watch later. This was the case in Anaheim for WonderCon 2013; Saturday passes officially sold out March 26th. The week of Con, Warner Bros. confirmed that Guillermo Del Toro would be on hand at 11:30am on Saturday morning to premiere the newest trailer for this Summer’s much anticipated, PACIFIC RIM; Bruce Campbell, Fede Alvarez, and Sam Raimi put out a video mentioning they would all be in Anahiem for the weekend to promote the EVIL DEAD. These two panels alone meant people lining up early to get in for a BIG day. Cosplayers, Food Trucks, and Exhibitors were not going to be out done by Hollywood’s presence and brought their “A Game” to the show too. Like Friday, WonderCon’s line for the Exhibit Hall, Arena, Autograph-wristbands, and general entrance was winding down the curb well before the 10am opening. Once inside, the lines were split into groups – those wanting access to the Exhibit Hall for exclusives like Graphitti’s Official WonderCon shirt by Jim Lee, attendees who wanted a chance at wristbands for the Pacific Rim and Evil Dead autograph sessions later in the morning, and finally those who wanted into the Arena to watch the Hollywood panels. Minus the usual lack of knowledge and few hiccups by the Security teams hired for the weekend, all lines ran smoothly. When the doors finally opened, Graphitti’s booth had a long line formed down the inside wall of the hall. Aisles in the Exhibit Hall were packed like a day at Comic Con in San Diego (very hard to move around in). DC Comics had artist signings, poster signings, and a line to try out the soon to be released, Injustice: Gods Among Us video game. Compared to last year, the Exhibit Hall floor was much larger and still could not fit all the crowds wanting to be a part of WonderCon – may be time to start taking over the entire convention center for the event, hint hint! Saturday also brought on many more hours of programming and lines for those rooms as well. Forgetting about Hollywood for a minute, Comic Book Publishers ran many panels with spotlights on John Layman of Image’s CHEW and DC’s Batman, DC Comics’ Jim Lee and many more. BOOM STUDIOS, ARCHAIA, IDW and ASPEC COMICS all hosted panels talking about their upcoming series’ and how they are bringing competition to DC and MARVEL. Anime and Manga fans were also included with panels by VIZ Media and the Anime Film Screenings (films ran all day, every day of the Con). CAPCOM held a “Remember Me” panel to talk about all their great games over the years in addition to their many upcoming projects. These days it’s hard to talk about a comic convention without talking about the presence of film and television studios. Saturday at WonderCon brought Warner Bros.’ new animated show, Teen Titans Go! 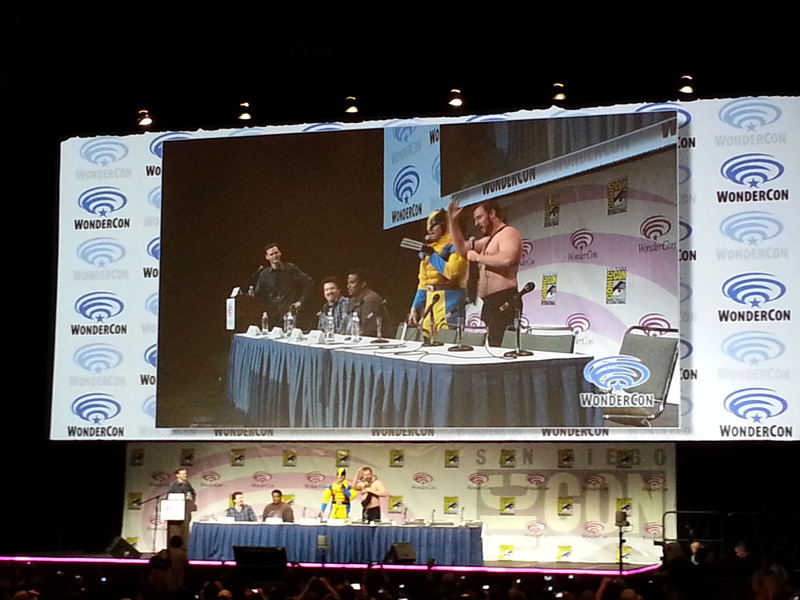 For a Q&A with fans; NBC’s Hannibal held an exclusive screening of the yet to premiere to show; and the History channel hosted a panel on their very popular show, Vikings. New to WonderCon’s map this year, was the Anahiem Convention Center’s famous Arena. The Arena is the largest single hall with a theater style set up. The fans packed in to catch Guillermo Del Toro talk about PACIFIC RIM and see a trailer for James Wan’s THE CONJURING, see a Q&A with the cast of NBC’s REVOLUTION, and find out about Sony’s EVIL DEAD reboot, MORTAL INSTRUMENTS’ first film outing, and Seth Rogan and James Franco in THIS IS THE END. Warner Bros. started with a little known film, THE CONJURING. Based on a true story of a paranormal investigation into a family’s home, James Wan worked with the daughters of the actual family that experienced what the film depicts. While showing the trailer the audience was screaming at the screen as the mother, played by Lili Taylor followed a strange bang down into a dark basement and the daughters stared into the darkness at a spirit they believed to see. This film will definitely have audiences jumping in their seats and make it hard to be home alone at night. Wan also brought famed paranormal investigator Lorraine Warren out on stage that is portrayed by Vera Farmiga in the film. 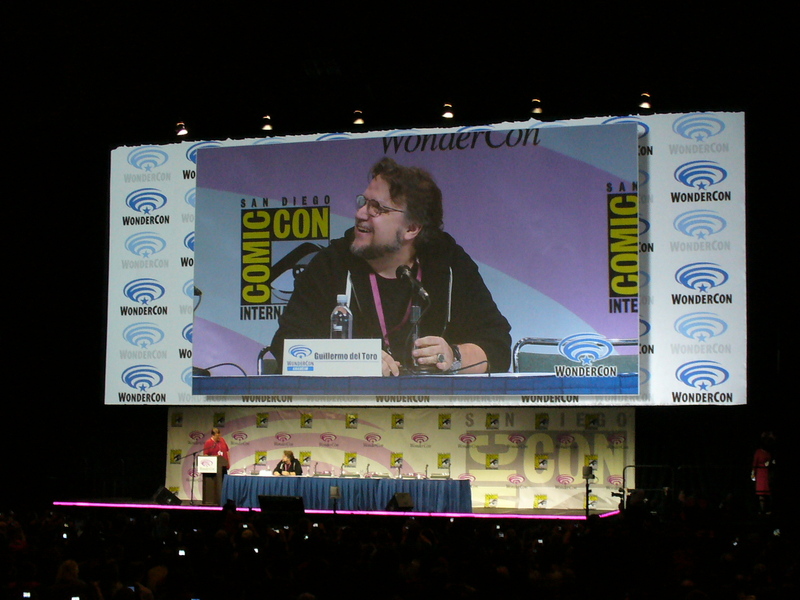 Del Toro was as a giddy as a school boy while talking about PACIFIC RIM and debuting the new trailer for the film. Fans were cheering and screaming at the amazing awesomeness that was on screen. Guillermo Del Toro went on to talk about how great it has been that the studio let him do everything he wanted to for the movie and didn’t f*ck with it. In partnership with DC Comics, Del Toro and Warner Bros. are going to release a prequel comic that talks about the beginnings of the monster versus robot war that takes place in PACIFIC RIM. He also mentioned that he has written his idea for how his comic book adaption of JUSTICE LEAGUE DARK will work. He plans on telling the story through the character of John Constantine (with a blond hair-do unlike Keanu Reeves adaption) going out to recruit the other members of the team and that the origin stories will be weaved into the film, not just all at the beginning. A writer for the DC Comics adaption will be announced very soon Del Toro added. The TRAILER PARK after Warner Bros.’ panel showed previews for MAN OF STEEL, MUCH ADO ABOUT NOTHING, and MARVEL’s anime film: IRON MAN: RISE OF TECHNOVORE. All were trailers previously released online and only meant to kill time in the Arena. REVOLUTION was next up and brought out the cast and director to tease about the rest of their first season, address the 4 month hiatus of the show, and tease a couple scenes from upcoming episodes. There was not much spoiled and a lot of discussion on the positive and negative of electricity and how that will play out in the upcoming episodes of REVOLUTION. Finally it was time for SONY’s panel and the build-up to Bruce Campbell’s appearance on stage. MORTAL INSTRUMENTS: CITY OF BONES had many fans in the audience and looks like a great adaption of the novel. 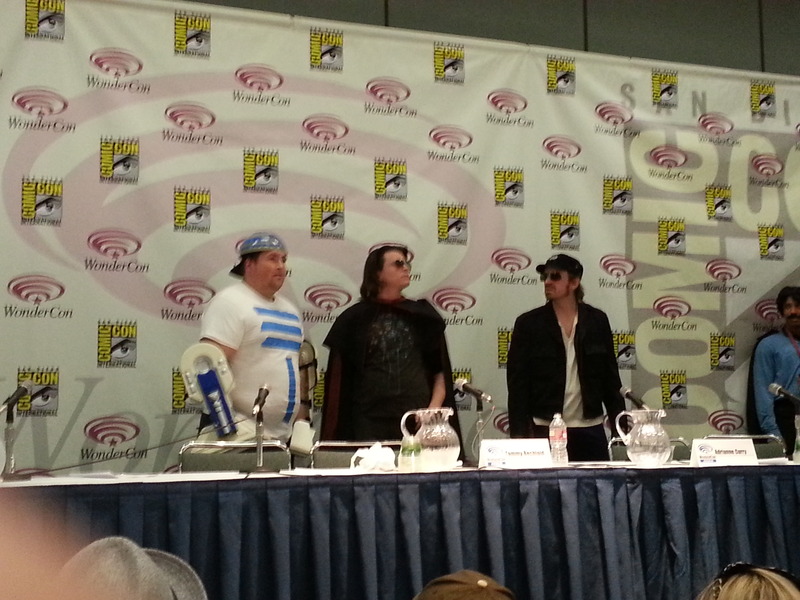 The author, Cassandra Clare, was excited to be at WonderCon and is hoping to get to make sequels. The actors talked about the hours of prep time it took to have their fake tattoos put on and the great costumes they got to wear in addition to all the fun they had learning how to use their various weapons. EVIL DEAD kicked off their time by showing a special WonderCon trailer for the film opening next week. Fans were cringing in their chairs at each bloody and gory shot and were standing and cheering by the end of the clips. The cast, Director Fede Alvarez, and Producer Bruce Campbell took the stage and the panel became the Bruce Campbell show. Fans had so many questions for the very famous, self-proclaimed King of B-movie actors. Campbell pushed many questions off on the film’s star, Jane Levy, and Fede Alvarez but did mention he hopes to end his life with seven Evil Dead films under his belt, including ARMY OF DARKNESS 2 which he confirmed he would be a part of. Alvarez talked about how he avoided the “CGI Trap” seen in most films and went for a very realistic look to his horror film. Levy and the rest of the cast all agreed with that statement and expanded on the hours of work they did on learning to contort their bodies and the secrets to scenes like projectile vomiting on each other or being buried alive. The film looks extremely realistic and scary but that does not seem to be stopping many fans from lining up to see the EVIL DEAD return to the big screen. The last session of the day was for THIS IS THE END that tells the story of the world ending and many comedy celebrities all being trapped at James Franco’s house trying to survive. Stars Craig Robinson, Danny McBride, Seth Rogen, and Evan Goldberg were on stage. Seth came out dressed like Wolverine and Evan in a BDS&M outfit in an apparent cosplay gag. They showed a new trailer for the film and talked about how much fun it was to make the movie as “exaggerated” versions of themselves. Jay Baruchel, Jonah Hill, Michael Cera, Paul Rudd, Kevin Hart, Emma Watson, and many other stars also portray themselves in the film; which is just a fun take on how to survive an apocalypse with your friends. THIS IS THE END hits theaters this Summer. A Saturday also means panels can go later at a Con. The annual WonderCon Anaheim Masquerade brought cosplayers of the highest level to the stage of the Arena to compete. Chris Gore held his PODCRASH panel with special guests Adrienne Curry and COMIC BOOK LIVE. NBC held a screening of the first two episodes of the new show, HANNIBAL. All events were packed audiences. The PODCRASH with Chris Gore was a talk with Adrienne Curry about her “nerd origin” and how she has come to be a nerd goddess. Afterwards, Curry joined the Improv comedy team COMIC BOOK LIVE for a quick preview of their STAR WARS EPISODE VII show they perform at the IO WEST in Hollywood (also stars Gore as C-3PO). 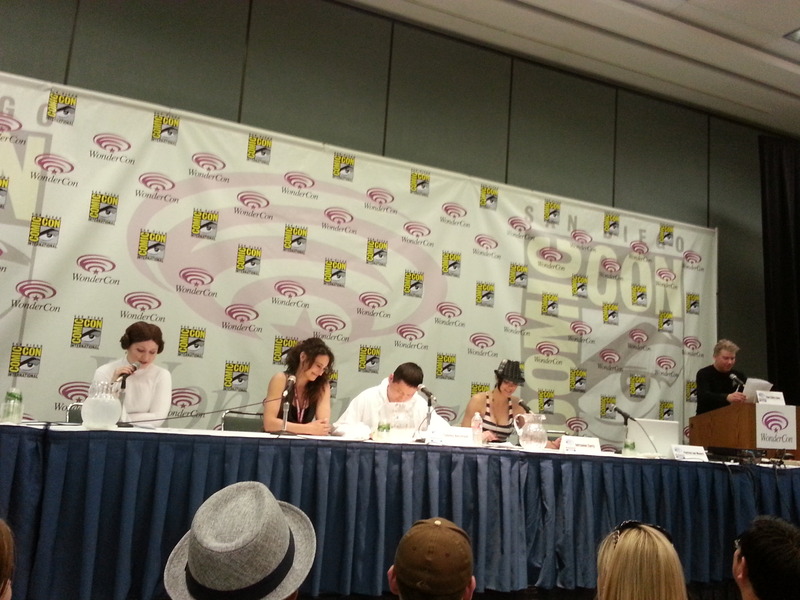 Hosting the panels in a small sized room was probably detrimental to PODCRASH and HANNIBAL (which shared room 213) as many fans were left in the hall when the room met capacity. Larger rooms like the 300 level halls were available but not used for some reason. The Masquerade had several entries this year as Cosplaying has grown to become so popular among attendees. The Arena nearly filled for the show of some of the biggest and best costumes of the weekend. Overall, Soldout Saturday was very crowded but the Comic Con International Staff did a great job with controlling the crowds. The one big (common) problem of the day, the Security; these teams hired for WonderCon (and San Diego) really need to be better screened. They never seem to know what’s going on and are never respectful to the people who matter, “Comic Con’s customers” – the attendees. Otherwise, Panels were filled and the Exhibit Hall aisles were packed all day and booths were frequently busy and that’s how it should be. Only one day left in Anaheim for WonderCon 2013 and big events still to come on Super Sunday.